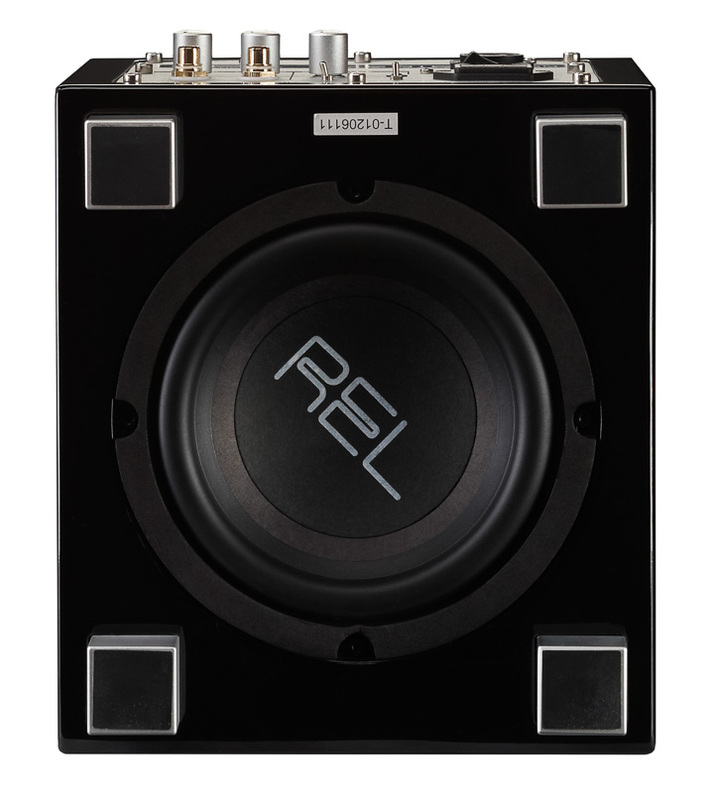 One of the last subwoofers we looked at was the REL T-Zero. In fact, we looked at two of them. This year, the company subtly changed the T-Zero. So subtly you’d hardly notice at first glance. So subtly in fact that I didn’t notice the difference at first and got really stroppy about the magazine reviewing the same thing twice. Sometimes it pays to be at least a little bit observant. OK, I could be forgiven for having a bit of a hissy fit because from the outside at least there seems to be no difference between T-Zero and T-Zero V2. The cabinet is the same tiny little thing, available in glossy black or white, it sits on four feet, has a REL badge on the top, and some controls at the rear that look functionally identical to what went before. Closer inspection reveals the change to a down-firing 165mm long-throw alloy cone where before there was a doped paper cone. Otherwise, everything else is functionally identical, including the 100W Class D and the rear control panel. The T-Zero V2 remains the smallest REL in the pack, it not being that much wider than its drive unit. If we still wore hats, someone would pipe up that the T-Zero is the size of a hat box. It delivers comparatively good bass for something so small, too. Of course, bigger is better, and more is better (and bigger and more is best of all), but if you want a tiny sub for a small home cinema system, the T-Zero V2 is a great choice. We’re not big on home cinema here, though. Instead, we’re all about the two-channel performance and that changes everything, even down to the way it’s connected. Where home cinema types will connect this to the LFE output of a multichannel amplifier, we go for the more high-level input, taking a feed direct from the loudspeaker terminals, and each REL is accompanied by a cable with a Neutrik connector at one end and three bare wires at the other. You plug the red wire into the right hand positive (red) speaker terminal, the yellow into the left hand positive (red) speaker terminal, and the black into one of the two negative black speaker terminals. If you want mono subs, you connect both red and yellow wires into the appropriate positive speaker terminal and black to the negative. We’d recommend two commoned mono subs instead of stereo, however. This is all fine and dandy... until you come across one of the increasing numbers of Class D amplifiers. Apparently, very few Class D designs reference the negative terminal to ground, instead using an approximate +15V reference instead. This doesn’t trouble the amp or the speakers but is not good practice when connecting up a powered subwoofer, as it can slowly cook the input stage of the sub, and more commonly cause hum. The way you get around this is to connect the red and yellow conductors as usual, leave the black unconnected (and taped up in case of accidental shorts) and then run a long RCA conductor from the LFE input of the REL to an unused amplifier input. This will create a ground for the REL. The change to an aluminium cone is possibly more important for audio than it is for home cinema, because it makes the REL a little tauter and faster sounding than before. Not by much – if you are considering trading your T-Zero for a T-Zero V2, don’t bother as you are 99%+ there already – but the already musically entertaining REL T-Zero gets a slice more fun and games when it crosses over to play music instead of movies. And the great thing about the T-Zero V2 is that it can disappear physically as much as it can sonically. This is a speaker you can hide behind another speaker, and even on show it doesn’t prove physically imposing.